From medium to long. Suddenly, a hint of salt is added. Warming, pleasant. 22. Balance - 19. More likely, non-drinkable. More like an Irishman or a spacer than a Highlander. Some razboltanny: a good nose, a floppy taste, but surprisingly nice finish. Smells spirity and vanilla, small sour / lime. Tastes sweet at first, but there is some spice. Finish gives a bit more complexity where the sweet and the spice come together. Yes it’s young and lacks depth. But it’s also vibrant, fun and drinkable. They bothered to put a vintage on the bottle (age is calculable) rather than create a fancy name and equal fancy story around this whisky. 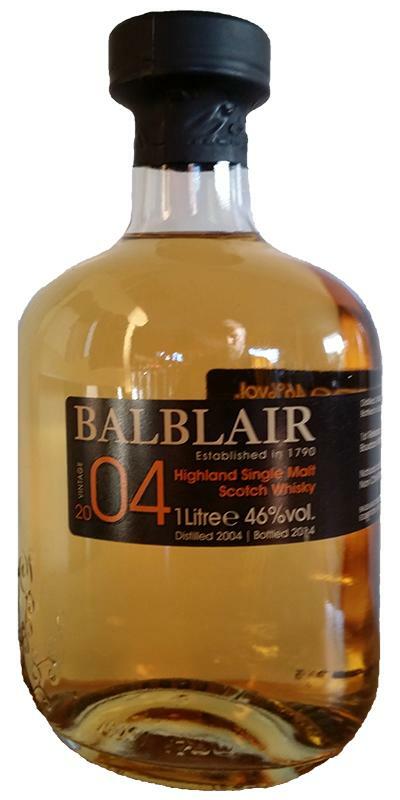 No instead Balblair gives you a natural coloured whisky with a vintage. I have to praise them for that. I’ve tasted this in a horizontal tasting of the 2000, 2001, 2002 and 2004. They are all quite similar but not the same. A fresh, young, fruity and subtle whisky with aromas of a faint whiff of fresh smoke (almost BBQ like), coumarin, citrus, vanille, fresh fruits, apple, pear, lemon peels, a slight herbal tone, earthy and subtle oak. A spicy, sweet, fruity and young whisky with aromas of white pepper, ginger, cherries, citrus, berries (bramble, red currants), red apple, backed apple, green banana, cereals, candied ginger, cinnamon, cardboard, pineapple, floral tones, tannins (its quite dry), peach, more pepper (even chili pepper) and subtle oak. A medium long and peppery, dry finish with aromas of chili peppers, white pepper, hot ginger, vanilla, tannins, backed apples, apple juice, tannins a wood spice.